When you are fresh out of school and looking for your first job, the process can be overwhelming. One of the most difficult aspects of job searching is putting together a good resume. A resume, a brief overview of your work experience, education, and skills, is a key document used by employers to narrow down the applicant pool. 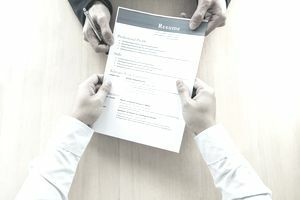 While your resume cannot get you a job, it can get you an interview – an important first step in securing a position. This guide contains important aspects of resume design and tips on what to include. While it may seem obvious, you would be amazed how many people submit beautiful resumes, but forget to include their contact information. Your resume should include your name, email address, phone number, and a link to your online portfolio or LinkedIn page if you have one. You may want to include your physical home address on your resume, list the city and state, or choose another option for including your address. Make sure your email is accurate and professional (as opposed to “cutesy”); if you have an address that contains mention of your hobbies or interests, create a new account with a free service like Google or Yahoo with just your name, such as Jane.Doe@gmail.com. If you dedicate this new email account exclusively to your career search, this will help to ensure that you don’t miss emails from potential employers. Make sure that your voicemail message also sounds professional. First impressions count, and hiring managers who call the phone number on your resume will draw inferences about you from the tone of voice and language you use on your voicemail. In the past, objectives have usually been included in resumes. But really, objectives in resumes are all the same; everyone is trying to get a job. Objectives are also problematic because they place too much emphasis on the needs of the job candidate as opposed to the needs of the employer the resume is targeting. Effective resumes are neither personal biographies nor statements of intent. Rather, they are marketing documents that “sell” your professional services to an employer by showing how your training and experience is “the answer” to what they are seeking in their next employee. Instead of listing personal objectives, then, make it easy for hiring managers by creating a short “qualifications profile” of the skills and talents you would bring to the table. It is a written form of your elevator speech, giving them a quick snapshot of who you are, what your experience is, and how your skill set meets the qualifications listed in their job announcement. A sample overview/qualifications profile for a graphic designer would state, "Seasoned graphic designer with 10 years of experience in print and digital media. Proficient with InDesign, Quark, and Photoshop. Solid foundation in HTML and CSS for creating websites." The most common resume form is ordering your employment history chronologically, with the most recent experience first. You do not have to include every role you ever had; if you are a seasoned manager, you do not need to include jobs you had in college or your internships. In the employment history, include your employers' names, the dates you worked at each place, your job title, and your accomplishments at each workplace. Focus on achievements rather than a list of tasks. For instance, if you are in public relations, instead of saying "distributed press releases," you would say, "Distributed over 200 releases to 500 outlets and had a publish rate of 50 percent." In your education section, include any college or post-graduate work. If you have a bachelor's degree or higher, there is no need for you to include the name of your high school. If you do not have a college degree, it's perfectly acceptable to include where you went to high school and when you graduated. If you have a strong GPA (3.5 or higher), feel free to include this in the education section. If you are a recent graduate, it is also a good strategy to list significant extracurricular activities (particularly those which demonstrate leadership). These include honors society memberships, Greek organizations, and campus/community volunteer roles. The sections listed above are the key elements of a resume. Use these sections to highlight your experiences, education, and talents. By using clear categories, you can make your resume visually engaging and more appealing to hiring managers. Review professionally written resume examples for jobs, internships, gigs, volunteering, and other positions.